The Polar explorers of the Victorian and Edwardian eras were superstars in their day. Exploration was a male domain, and most women encountered the wilder parts of the world only second-hand. But a handful struck off on a bold path in pursuit of broader horizons by becoming "polar wives". In her portraits of sculptor Kathleen Scott; traveller Jane Franklin; poet Eleanor Anne Franklin; Jo Peary, the first white woman to travel in the high Arctic; tenacious Emily Shackleton; celebrated Norwegian singer Eva Nansen; and her own mother, Marie Herbert, author Kari Herbert mingles accounts of longing, betrayal and hope with instances of breathtaking danger. 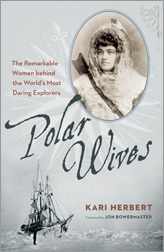 In Polar Wives, she has crafted marvellously engaging book that finally gives each of her remarkable subjects their due.